Dr. Meriam B. Macalisang of NADA Philippines Batch October 2014 shared her musical talent and skill and composed a song for NADA entitled “Just Five Needles.” The song puts into words the Vision, Mission and goals of NADA, the roots of the five-point protocol, the effects of the ear acupuncture treatment and the message of unity and universality. The song and lyrics can be found below. The Proceedings for the NADA Philippines Fourth Annual Forum held last February 28, 2015 is now available. You may view the file below. Limited copies of the printed version will be available soon. 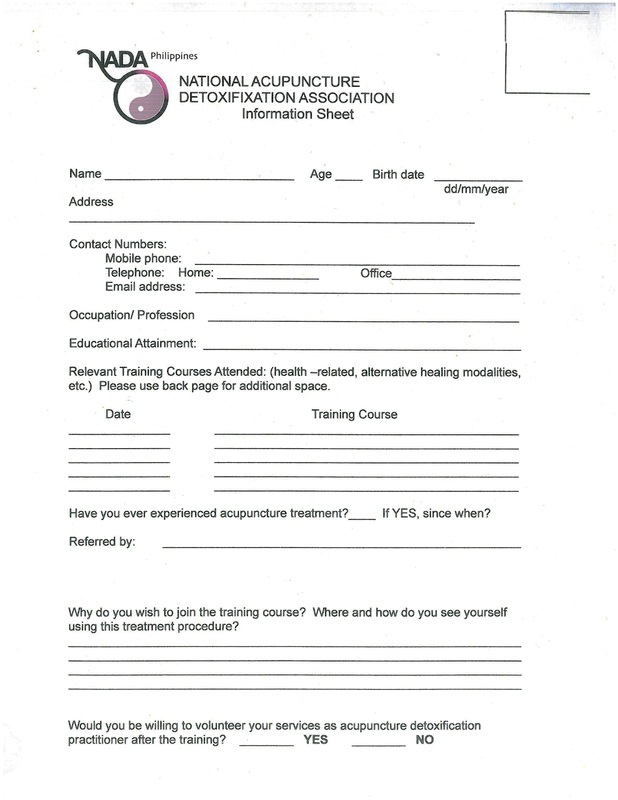 On May 4-9, 2015, NADA Philippines held the six-day Acudetox Specialist (ADS) training at the Sta. Rafaela Maria House of Spirituality, Brgy. Culiat, Tandang Sora, Quezon City. Last March 19, 2015, NADA Philippines’ application for accreditation as a TAHC (Traditional and Alternative Health Care) Organization by PITAHC-DOH (Philippine Institute for Traditional and Alternative Health Care – Department of Health). 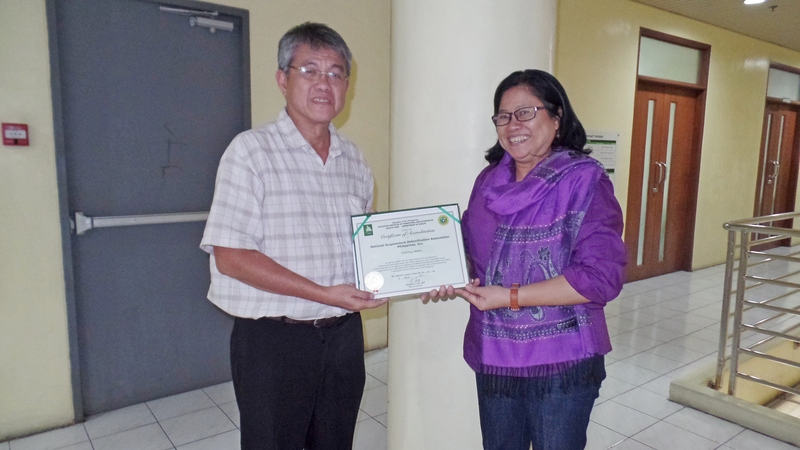 Dr. Isidro Sia, PITAHC Director-General, handing the Certificate of TAHC Org Accreditatation to Ms. Janet Paredes, NADA Philippines President. 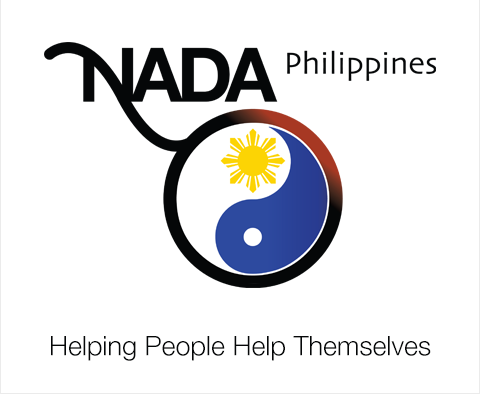 On February 28, 2015, NADA Philippines held its Fourth Annual Forum at the Center of Family Ministries (CeFaM) Seminar Room in Ateneo de Manila University, Quezon City. The theme for the forum was “Ang Diwa ng NADA: Tungo sa Ugnayan ng Bawat Pamayanan (The Spirit of NADA: Towards Linking Every Filipino Community).” Acudetox Specialists (ADSes) from all over the country gathered to listen to and share their own experiences in giving acudetox treatment in their various communities. Last July 29, 2014, a group of five Acupuncture Detoxification Specialists (ADSes) from NADA-Philippines travelled to a rehabilitation facility in the island of Masbate to give treatment to the recovering substance users currently housed there. They stayed for four days and treated a total of forty patients, which is composed of the substance users and the volunteers in the facility. On May 2014, a team of NADA (National Acupuncture Detoxification Association) Acupuncture Detoxification Specialists went up north to Sagada for an R&R-slash-medical mission lasting for two days.